As soon as India passed 200, it didn't look like Pakistan could do it. When Afridi got out, it was clear that India was going to win. Pakistan are one of the worst bottlers when chasing. Waking up at 3 AM for India - Pakistan was completely worth it! Our bowlers really won it for us, it was a very good, strategic game. Unlucky for Pakistan that they couldn't get Tendulkar out. Riaz bowled very well for Pakistan, too. On to the finals!!! Stupid appeal against Tendulkar. If they hadn't appealed it, Pakistan could have won. Probably could have, yes. To be honest, Pakistan shot themselves in the foot, I really thought the game was theirs to lose after India's innings. Especially when players like Yuvraj went out on 0, Kohli went for 9 and Dhoni went for just 25. You could say we were lucky, but our bowlers bowled very tactically and very well. The odds are always against Pakistan when they're chasing those kinds of totals. We were lucky Wahab Riaz had the best bowling game of his career today; Umar Gul sucked. It could easily have been 300 if the first few overs were anything to go by for India. Yeah, Sehwag was thrashing Gul. Something like 8 overs for 69 runs? Ouch. If Riaz didn't play a blinder, then we'd probably reach 300 something. Better luck next time, my friend. ADesh1892 wrote: Yeah, Sehwag was thrashing Gul. Something like 8 overs for 69 runs? Ouch. If Riaz didn't play a blinder, then we'd probably reach 300 something. Better luck next time, my friend. Now I need to decide who to support in the final. Most of my extended family is Indian, so I don't know if I want to side with them or mess with them. Actually, I win either way. If India win, I can celebrate because I'm part Indian. But if Sri Lanka win, I can mess with them more. True. Hmm if I were you, I'd support India because it was a great game. Being on the losing side must have been so tough, but it was a great effort from both teams. It was annoying when Misbah decided to start hitting boundaries right at the end. Gave me a false sense of hope for the last three overs. I almost spat over my mates phone (we were at school, so we were checking on his phone) when he hit the six. I haven't gotten around to watching a match. Hopefully I'll catch the final. I was sitting in my driver's ed class texting my friend who has a 3G phone. We only do bookwork in DE, so we texted back and forth quite a lot. It's not normally something I'd do TBF. After that class, we had advisory together, so we sat there checking Cricinfo. I can put up with losing. What I can't put up with is people celebrating when they haven't a bloody clue. it's okay, I remember driver's ed being really boring. I know driving is serious and all but I feel like they make it sound so hard. It's easy as hell to drive. I absolutely hate those kinds of "fans". We're going to lose in the final anyway. 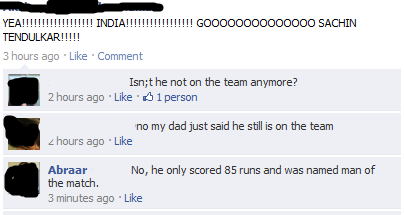 Luckily there aren't too many Indian fans to wind me up when that does happen. Sri Lanka vs India. Bit nervous since we're the underdogs. The underdogs are the ones who shouldn't be nervous. The favorites are the ones with all the pressure on them. menalawyerguy wrote: The underdogs are the ones who shouldn't be nervous. The favorites are the ones with all the pressure on them. you don't strike me as a guy who would watch Cricket. Are you Caucasian?